اسمعیلی مقدم, سعید, مسعودی فر, مسیح, شمسیان, محمد, نصرتی, بابک. (1395). تاثیر تیمار شیمیایی آرد چوب بر روی برخی از خواص کامپوزیت چوب پلاستیک. مجله صنایع چوب و کاغذ ایران, 7(3), 449-462. سعید اسمعیلی مقدم; مسیح مسعودی فر; محمد شمسیان; بابک نصرتی. "تاثیر تیمار شیمیایی آرد چوب بر روی برخی از خواص کامپوزیت چوب پلاستیک". مجله صنایع چوب و کاغذ ایران, 7, 3, 1395, 449-462. اسمعیلی مقدم, سعید, مسعودی فر, مسیح, شمسیان, محمد, نصرتی, بابک. (1395). 'تاثیر تیمار شیمیایی آرد چوب بر روی برخی از خواص کامپوزیت چوب پلاستیک', مجله صنایع چوب و کاغذ ایران, 7(3), pp. 449-462. اسمعیلی مقدم, سعید, مسعودی فر, مسیح, شمسیان, محمد, نصرتی, بابک. تاثیر تیمار شیمیایی آرد چوب بر روی برخی از خواص کامپوزیت چوب پلاستیک. مجله صنایع چوب و کاغذ ایران, 1395; 7(3): 449-462. این تحقیق، با هدف بررسی تاثیر تیمار شیمیایی آرد چوب بر روی برخی از خواص فیزیکی، مکانیکی و مورفولوژیکی کامپوزیت چوب پلاستیک انجام گردید. تیمار شیمیایی آرد چوب در 7 سطح بدون تیمار، استیلاسیون، بنزیلاسیون، مرسریزاسیون، هیدروکسید منیزیم، هیدروکسید کلسیم و تیمار آب گرم به عنوان عامل متغیر در نظر گرفته شد. برای سنجیدن شدت واکنش آرد چوب با مواد شیمیایی، درصد تغیررات وزن (WPG) محاسبه گردید. پس از انجام تیمار شیمیایی، آرد چوب با نسبت وزنی 60 درصد با پلی‌پروپیلن به همراه phc 4 جفت‌کننده مالئیک انیدرید پلی‌پروپیلنی در داخل دستگاه اکسترودر مخلوط شد و نمونه‌های آزمونی با استفاده از دستگاه قالب‌گیری تزریقی ساخته شدند. سپس آزمون‌های مکانیکی شامل خمش، کشش و ضربه و آزمون‌های فیزیکی شامل جذب آب و واکشیدگی ضخامت بر روی نمونه‌ها مطابق با استاندارد (ASTM) انجام گرفت. همچنین به منظور بررسی ریخت‌شناسی کامپوزیت‌ها از میکروسکوپ الکترونی پویشی (SEM) استفاده گردید. نتایج نشان داد که در اثر تیمار شیمیایی آرد چوب، خواص مکانیکی کامپوزیت‌های چوب پلاستیک افزایش یافتند در حالی که جذب آب و واکشیدگی ضخامت کاهش یافتند. در اثر انجام تیمار شیمیایی آرد چوب وزن آرد چوب افزایش یافت و بیشترین درصد تغییرات وزن مربوط به تیمار بنزیلاسیون بود. همچنین نتایج حاصل از میکروسکوپ الکترونی پویشی حاکی از بهبود در فصل مشترک بین الیاف و ماتریس پلیمری در اثر تیمار شیمیایی بود، به طوری که در نمونه‌های تیمار شده بیرون‌زدگی الیاف از داخل ماتریس مشاهده نشد. Viksne, A., Rence, L. and Berzina, R., 2003. Influence of modifiers on the physic mechanical properties of sawdust-polyethylene composites. Mechanics of Composite Materials, 40(2): 169-177. Ashori, A., 2008. Wood-plastic composites as promising green-composites for automotive industries. Bio resources Technology, 99: 4661-4667. Matuana, L.M., Park, C.B. and Balatinecz, J.J., 1998. Cell morphology and property relationships of microcellular foamed PVC/wood fiber composites. Polymer Eng Sci, 38: 1862-1872. Mohebby, B., 2003. Biological attack of acetylated wood. Ph.D. Thesis, Gottingen University, Gottingen, 147 p. (In Persian). Hill, C., 2006. Wood modification chemical, Thermal and Other Process John Wiley and Sons Ltd, 260 p.
 Albano, C., Ichazo, M., Gonzalez, J., Delgado, M. and Poleo, R., 2001. Effects of filler treatments on the mechanical and morphological behavior of PP+wood flour and PP+sisal fiber. J. Mat. Res. Innovate, 4: 284-293. Mishra, S., Tripathy, S.K. and Mohanty, A.K., 2001. Graft copolymerization of acrylonitrile on chemically modified sisal fibers. Macromolecular Material and Engineering, 286(2): 107-113. Luz, S.M., Del Tio, J., Rocha, G.J.M., Goncalves, A.R. and Del’Arco, Jr.A.P., 2008. Cellulose and cell lignin from sugarcane bagasse reinforced polypropylene composites: Effect of acetylation on mechanical and thermal properties. Composites: Part A, 39: 1362–1369. Kord, B. and Taghizadeh Haratbar, D., 2014. Influence of fiber surface treatment on the physical and mechanical properties of wood flour-reinforced polypropylene bionanocomposites. Journal of Thermoplastic Composite Materials, DOI: 10.1177/0892705714551592. Kalagar, M., Baziyar, B., Khademi eslam, H., Ghasmi, E. and Hemmasi, A.H., 2015. The investigation on composites produced using polylactic acid/wheat straw fibers treated with silane. 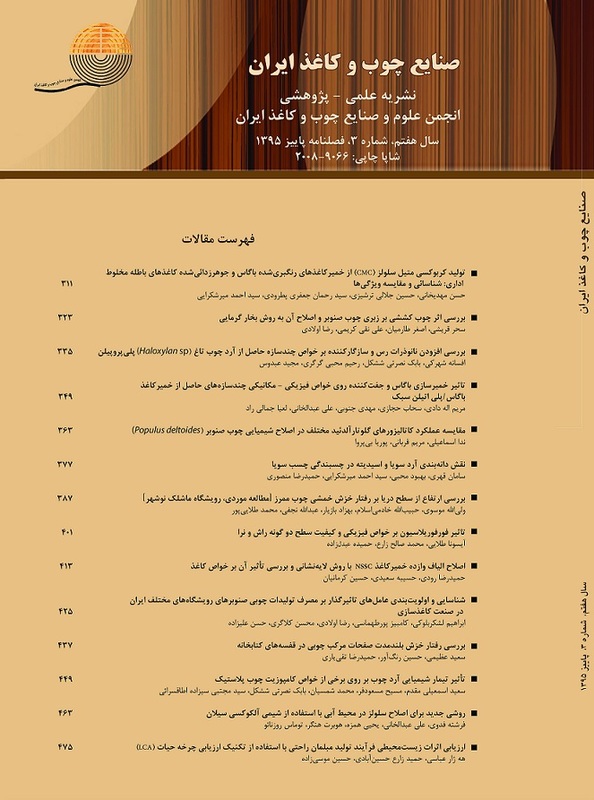 Iranian Journal of Wood and Paper Science Research 30(2): 207-219. (In Persian). Ghasemi, I. and Farsi, M., 2010. Interfacial behavior of wood plastic composite: effect of chemical treatment on wood fibers. Iran Polymer J, 19(10): 811–818. (In Persian). Susheel, K., Kaith, B.S. and Inderjeet, K., 2009. Pretreatments of natural fibers and their application as reinforcing material in polymer composites: a review. Polymer Eng Sci, 49: 1253–1272. American Society for Testing and Materials. ASTM. Standard practice for injection molding test specimens of thermoplastic molding and materials. Annual book of ASTM standards, Philadelphia, ASTM D3641-12, 2012. American Society for Testing and Materials. ASTM. Standard practice for conditioning plastics for testing. ASTM D618-13, for testing, Annual book of ASTM standards, Philadelphia, ASTM D618-13, 2013. American Society for Testing and Materials. ASTM. Standard test method for flexural properties of unreinforced and reinforced plastics and electrical insulating materials. Annual book of ASTM standards, Philadelphia, ASTM D790-10, 2010. American Society for Testing and Materials. ASTM. Standard test method for tensile properties of plastics. Annual book of ASTM standards, Philadelphia, ASTM D638-10, 2010. American Society for Testing and Materials. ASTM. Standard test methods for determining the izod pendulum impact resistance of plastics. Annual book of ASTM standards, ASTM D256-10, 2010. American Society for Testing and Materials. ASTM. Standard guide for evaluating mechanical and physical properties of wood-plastic composite products. Annual book of ASTM standards, Philadelphia, ASTM D7031-11, 2011. Dominkovics, Z., Danyadi, L. and puka'nszky, B., 2007. Surface modification of wood flour and its effect on the properties of PP/wood composites. Composites Part A, 38(8): 1893-1901. Li, X., Tabil, L.G. and Panigrahi, S., 2007. Chemical treatments of natural fiber for use in natural fiber reinforced composites: a review. J. Polymer Environ, 15: 25–33. Farsi, M., 2010. Wood–plastic composites: influence of wood flour chemical modification on the mechanical performance. J Reinf Plast Compos, 29(24): 3587–3592. Nourbakhsh, A., Karegarfard, A. and Ashori, A., 2010. Effects of particle size and coupling agent concentration on mechanical properties of particulate-filled polymer composites. J Thermoplastic Compos Mater, 23(2): 169–174. Kalia, S., Kaith, B.S. and Kaur, I., 2009. Pretreatment of natural fiber and their application as reinforcing material in polymer composites. A review polymer Engineering and science, 49(7): 1253-1272. Rosenqviset, M., 2001. Acetyl group distribution in acetylated wood investigated by micro autoradiography. Holzforschung, 55(3): 270-275. Espert, A., Vilaplana, F. and Karlsson, S., 2004. Compression of water absorption in natural cellulosic fibers from wood and one-year crops in polypropylene composites and its influence on their mechanical properties. Journal of composites Part A, 35(11): 1267-1276. Liu, W., Mohanty, M. and Askeland, A.K., 2004. Influence of fiber surface treatment on properties of Indian grass fiber reinforced soy protein based bio composites. J Polymer Sci, 45(22): 7589–7596. Militz, H. and Beckers, E.P.J., 1994. Process for acetylating solid wood, European Patent Application, 85850268.5.